The 1st invocation bears the stamp of musical material taken from the chorale "Aus tiefer Not schrei' ich zu dir", initially more in brief motifs which undergo musical development and interpenetrate each other. Towards the end of the movement (at the "sectio aurea") the chorale melody is quoted - transposed successively line for line by a whole tone. The melody is then lost again amidst motifs from the opening invocation. In the 2nd invocation, the solo instrument takes up on a repeated note the speech rhythm of the Latin title. This expressive technique recurs seven times during the movement, producing clear formal divisions. The melodically and contrapuntally developed intermediate sections also show signs of the speech melody of "In te domine speravi". The 3rd invocation begins with an 8 note solo trumpet call which recurs, often varied, in the following section with a culminating solo cadenza for the trumpet. The 8 notes form the basis of the concluding Passacaglia, in which the principal thoughts of all three movements reappear. The work, a commission for the Organ Concert Series in the Freiburg Minster where it received its first performance in 1978, dies away in extreme piano. "De profundis", the first of the three "Invocations", is based on the chorale "Aus tiefer Not schrei' ich zu dir" (after the Psalm "From the depths I cry to you, oh Lord"). The organ introduction expresses the "De profundis" ("From the depths ") through a repeated descent from B-flat to A and a pedal-point on E as a trill. After fanfare-like, constantly accelerating tone repetitions, the solo instrument intones a motif formed out of the beginning of the chorale melody and lets this sound on as an echo before then continuing to freely weave the melody further. The organ passages then mount to increasingly high levels of virtuosity, after which the saxophone presents the complete chorale melody in free declamation, setting a very tranquil close with a double repetition of the three last notes and then joining with the organ in a constantly intensifying final section culminating in a triple forte with a brilliant tremolo (flutter-tonguing in the trumpet). The next two "Invocations" are based on the the two final sections of the Te Deum. "In te Domine speravi" ("In you, Lord, have I hoped") starts with a recitation by the solo instrument, corresponding to text, on f-sharp. Following an echo-like repetition, the eight-note theme (quasi a setting of the text) enters espressivo, is developed and - symbolising musically the increasing hope - intensified, until the climax in fff brings the recitation to the note e, at which point the Invocatio with theme and recitation gradually fades away as if to nothing. "Non confundar in aeternum" ("Do not let me be confounded for ever") is opened with the theme, forte and in half-notes, by the solo instrument alone. Subsequently, the organ contributes an ostinato figure in a manual and another in the pedals. The Invocatio leads into a large-scale cadenza, fading out in an echo. Something of the "De profundis" motif is to be heard again, its call for help answered by the "Non confundar in aeternum", resounding in unshakeable faith (ostinato accompaniment! ), ebbing away then gradually in a triple piano. The work was conceived for trumpet and organ in 1978 as a commission for Freiburg Minster and received its first performance on September 5th of the same year on the occasion of the Catholic Convention. 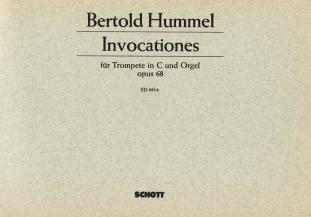 Hummel uses liturgical invocations to make an expressive and deeply felt statement of faith in this work, in which a tonal, if harmonically and dynamically extremely bold trumpet part is combined with a completely contrasting organ part drawing on all resources available on the modern organ (concentrations of fortissimo outbursts; tone cluster-like massings; multifaceted beds of sound; hovering and fading beats in pianissimo). This gripping work wins over the listener with its rich treatment of familiar chorale themes.